Product #16575 | SKU SG2LRE6 | 0.0 (no ratings yet) Thanks for your rating! 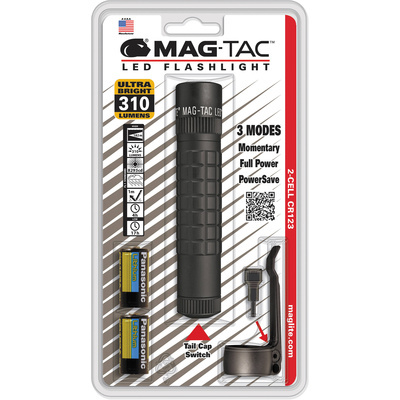 The matte black Mag-Tac LED Flashlight from Maglite is a handheld illumination tool designed for civilians yet reliable enough for tactical professionals. Its 310-lumen LED light source is capable of producing a beam visible at a range of 200 yards. Like other Maglites, the Mag-Tac is machined from a lightweight aluminum alloy, anodized inside-and-out for enhanced corrosion-resistance, and manufactured in the United States.